The Purple 4 mattress combines a 4" layer of honeycomb gel atop an 8" layer of more traditional pocketed steel coils. It's definitely a unique combination, but is it right for you? Read on for our full review. Note: Purple debuted its original mattress in 2015 and has become one of the most searched brands on the internet. The company has now added to its lineup with a series of three additional models, which are discussed in this review. 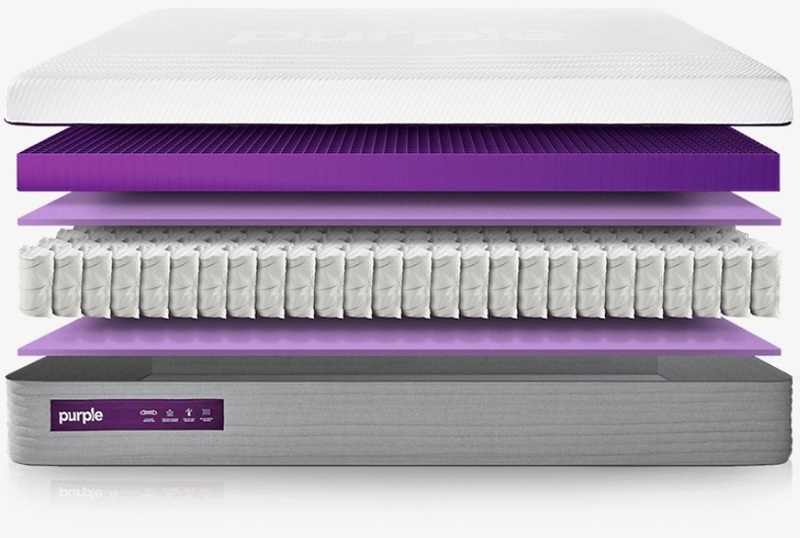 All Purple mattresses use the company’s honeycomb hyper-elastic polymer gel as the top layer. The Original Purple mattress features 2” of the gel grid layer, while the Purple 2, Purple 3, and Purple 4 include 2”, 3”, and 4” respectively of this material. However, the newer mattresses have a support layer comprised of pocketed steel coils instead of foam. We tested the Purple 4, the most expensive and the softest of the three new models. Based on our tests of this model, as well as our evaluation of the Original Purple mattress, we are able to provide guidance in this review relating to the Purple 2 and Purple 3 as well. 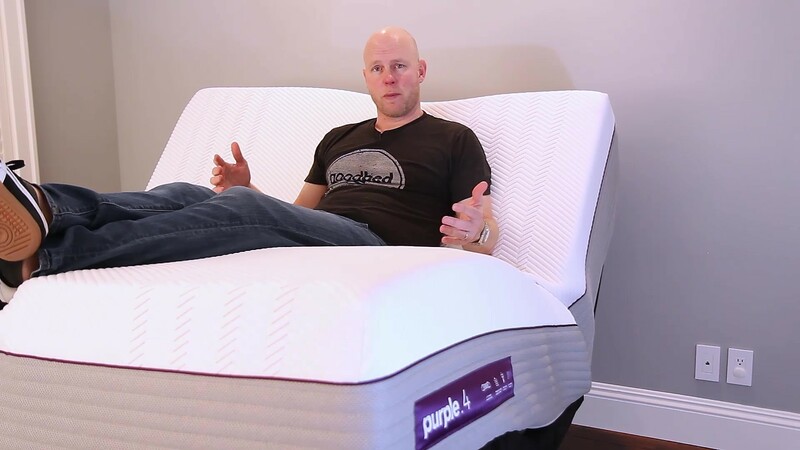 If you’d prefer to watch rather than read, check out our full Purple 4 mattress video review above. GoodBed's Take – Who is the Best Match for a Purple 4 Mattress? The Purple 4 excelled in our evaluation particularly for side sleepers, with excellent pressure relief and spinal alignment in that position for almost all individuals, with the possible exception of those who are very light. Finding a mattress that works well for side sleepers is possibly the trickiest; you need a model that allows your hips and shoulders to sink deeply into the comfort layer of the mattress without hitting the firmer support layers below, and without compressing the mattress so much that your waist/sides are unsupported. We found the Purple 4 to be a real standout in this respect. In our evaluations, we found the Purple 4 mattress to have a Medium softness level (the Purple 3 and Purple 2 are correspondingly firmer). The honeycomb design means that the top gel layer buckles rather than simply compressing, so the heavier parts of the body (hips, shoulders) are nicely cradled while lighter/concave parts, like the lumbar area, remain supported by the un-collapsed honeycomb gel. For side sleepers in particular, 4” of the gel provided the most excellent advantage for side sleepers. The Purple website has lots of pictures of the hyper-elastic polymer. If you like to sit on the edge of the bed, or if you find you tend to sleep right on the very edge (think about pets and partners that hog the bed! ), we think the Purple 4 is also a strong choice. With a thoughtful foam edge support surrounding the honeycomb gel and coils, our tester found edge support to be both stable and seamless. He never felt he was sliding off the bed. The Purple 4 mattress (as well as the Original Purple mattress tested previously) also excelled in our tests for ease of repositioning. Changing sleeping positions was virtually effortless for our tester, so if you tend to move around a lot while sleeping, all of the Purple mattresses deserve consideration. We also found the Purple 4 to be a very “cool” mattress that channels heat away from the body and provides very good airflow—that’s helpful for those who tend to sleep hot, or even for women experiencing hot flashes. Among our concerns: While motion isolation overall was good overall, the gel layer does transfer noise and vibration, so it may not be ideal for those who are easily disturbed by a partner that repositions frequently. And while our tester experienced excellent sleep-sleeping support, back support was average (and not quite as good as the Original Purple in our view), and stomach sleeping was also not ideal. You can place the Purple 4 mattress atop the support of your choice, including a separately purchased box support (supports with springs are not recommended, and will void the warranty), a bed frame, platform bed, or adjustable bed frame. Overall, we judged the Purple 4 to be an excellent choice for side sleepers, and for those who prioritized edge support, ease of repositioning, and for those seeking a ‘cool’ bed. But overall value is a question mark and will depend on your priorities and budget. Below: This is the "honeycomb" gel used in the center of the mattress; note how it behaves when compressed. More on that in the sections below. 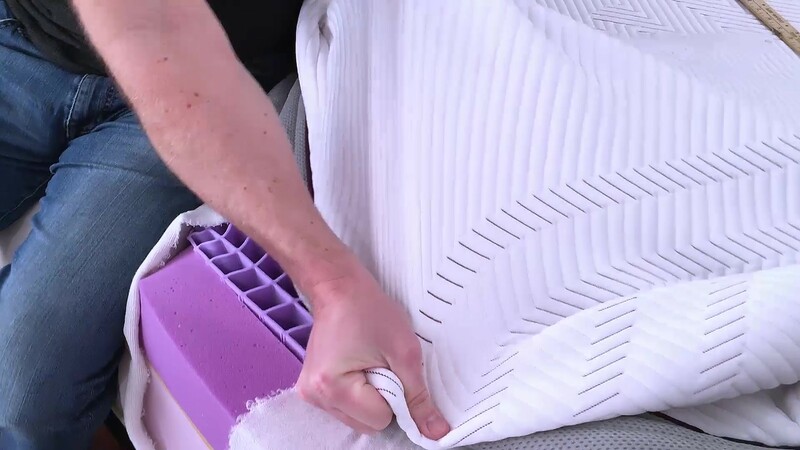 The top comfort layer of the Purple 4 mattress is comprised of a unique 4-inch honeycomb or column gel layer that, instead of simply compressing, buckles under pressure. This layer is actually comprised of 2.5” and 1.5” honeycomb layers that have been bonded together, totaling 4”. The company calls it the “Purple Smart Comfort Grid.” Note that the Purple 4 has a 4” gel layer while the similar Purple 3 and Purple 2 have 3” and 2” layers, respectively. The honeycomb gel is powder coated to ensure that that when collapsed, the columns do not stick to each other. Under the honeycomb gel, separated by a thin ½-inch foam pad, is an 8” layer of pocketed coils made of 13.75-gauge steel. Around the perimeter of the bed is a 3” wide foam edge support comprised of two layers of foam: softer foam at the top to mimic the feel of the honeycomb gel, and a firmer foam on the bottom to complement the coil layer. The layers of the Purple 4 mattress (as well as the Purple 2 and Purple 3) are wrapped in a soft poly-stretch cover. We stretched, tugged, and pulled at the cover and found it to be strong and substantial. Note that while the Purple 4 mattress is warranted for 10 years, the cover warranty is two years. Overall, we class the Purple 4 as a Medium Soft mattress. If you’ve read our review of the company’s Original Purple mattress, you’ll note that we also classed that mattress as Medium, so you may wonder why the Purple 4, with it’s 4” of honeycomb gel, and the Original, with 2” of the same material, feel similar to us. While the two mattresses share the same comfort layer material, the Purple 4 includes 8” of pocketed coils as its support layer while the Original Purple has an all-foam support layer. In our view, the more supportive coils of the Purple 4 balance out the 4” of hyper-elastic gel so you end up with a mattress that feels very similar in terms of softness to the Original Purple mattress. If you are looking for a firmer version, the Purple 2 and Purple 3 are the firmest and next firmest in the line. We found the Purple 4 to be quite unique when considering cushioning depth, our estimation of how deeply you sink into a mattress versus floating or resting on top of it. In this respect, we found the Purple 4 to represent a hybrid. Particularly when lying on your side, the heavier/pointier parts of the body such as hips and shoulders, sink deeply into the mattress, giving you a feeling of being hugged or cradled (we’ll soon talk more about how this characteristic contributes to what we experienced as excellent pressure relief). On the other hand, when lying on your back, where your body’s weight is spread over a larger area, you don’t sink as deeply and have more of a floating-on-top sensation. When we placed our 16-lb bowling ball on the mattress, it sunk down a bit more than average, so overall, we would class this mattress as slightly deeper than average in terms of cushioning. Note that the other two mattresses in the line, the Purple 2 and Purple 3, would both offer less cushioning depth. While the top layer of all of the Purple mattresses is gel, its honeycomb/grid construction means that it has a lot of structural integrity. It springs back almost immediately when compression stops. Practically speaking, that means there is none of that ‘memory foam feel’ where a typical memory foam layer recovers slowly in a melting way. We also noticed some interesting bounce characteristics. The top gel layer contributes to quite a bit of surface bounce, while the lower pocked coils are responsible for a deeper bounce with the steel springs literally pushing our tester back up when he tossed himself on the Purple 4. The total result is a mattress that has a lot of spring—we judged it one of the bounciest mattresses we’ve tested so far. We found the Purple 4 mattress really interesting from this perspective. While our 200-lb tester was lying on his back, he felt well supported, but also felt like he wasn’t really getting the full benefit of 4” of the gel material, which adds significantly to cost over the Purple 2, Purple 3 and the Original Purple Mattress. In fact, he slightly preferred the Original Purple mattress, with its 2” of honeycomb gel, noting that his lumbar area felt slightly better supported with the Original Purple bed. For stomach sleeping, our tester felt that he just didn’t want to be in that position very long on the Purple 4, with his hips sinking into the mattress more than he wanted from a spinal alignment perspective, again feeling that the Original Purple bed, or the Purple 2 might work better for a stomach sleeper. However, the game changes for side sleeping on the Purple 4, and if you primarily sleep in this position, we found it one of the best mattresses we’ve tested. In the side position, hips and shoulders sunk deeply into the mattress for excellent spinal alignment and pressure relief. Our tester felt that the Purple 4’s two layers of honeycomb gel were a big advantage for side sleepers, and a noticeable improvement over the Original Purple mattress we also tested. Another note: With the Original Purple mattress’s 2” of honeycomb gel up top, our tester felt that heavier (250 lbs+) side sleepers could bottom out, fully collapsing all 2” of the gel and resting on the firmer solid foam support layers. But with 4” of honeycomb gel on the Purple 4, it seems very unlikely that would happen. So not only do we feel that the Purple 4 is a strong choice for side sleepers, but for side sleepers of any weight. One consideration for those who are on the lighter side (less than 150 lbs), is that they might not need all 4” of that honeycomb gel, and might consider going with the Purple 3 or Purple 2 instead. Our 200-pound tester felt this mattress to be very good while on his back, but found he preferred the Original Purple mattress, noting that he felt his lumbar area was better support with the Original. While we felt the Purple 4 was a solid choice for back sleeper, it really excelled for side sleeping. Spinal alignment for our tester in the side position was excellent, surpassing that of the Original Purple mattress. The 4” honeycomb gel layer allowed his hips shoulders to get deep enough into the mattress to allow the top of his spine to remain level. We believe the Purple 4 mattress would provide good spinal alignment for most side sleepers, even heavier sleepers (over 250 lbs). Lighter individuals might not depress the gel layer as much and may not fully benefit from 4” of the honeycomb gel, and might prefer the less expensive Purple 2 or Purple 3 as alternatives. Achieving good spinal alignment for stomach sleepers can often be trickier as the hips can tend to sink down too far with some mattresses, and that was the case here. Our tester felt that his hips sunk too deeply into the mattress to keep his spine in alignment, noting that the Original Purple or the Purple 2 might be better choices for those who sleep primarily on their stomachs. As discussed, we felt that the Purple 4 really excelled in this area for our 200-lb tester, and we surmised that heavier and slightly lighter people would experience the same benefits. Lighter people, we felt, but not have quite the same experience, as they may not be heavy enough to really feel the benefit of all 4” of that hyper-elastic honeycomb gel; saving money on with the Purple 2, Purple 3 or Original Purple mattress might make more sense for those under about 150 lbs. 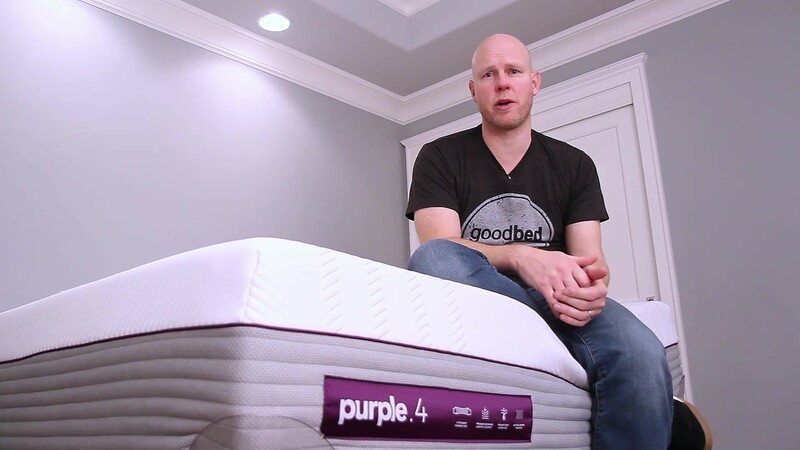 In our view, pressure relief and spinal alignment are really the sweet spot for the Purple 4 and represents a strong improvement over the Original Purple mattress we reviewed earlier. With a bowling pin standing upright on the Original Purple 4 bed, we tested motion isolation by dropping a 16-lb. bowling ball on it, as well as the whole weight of our 200-lb. tester. Our results here were very unusual. When we dropped the bowling ball, the pin teetered and dropped immediately. We attribute this to the surface bounce properties in the honeycomb layer, almost like when you ‘twang’ a rubber band. 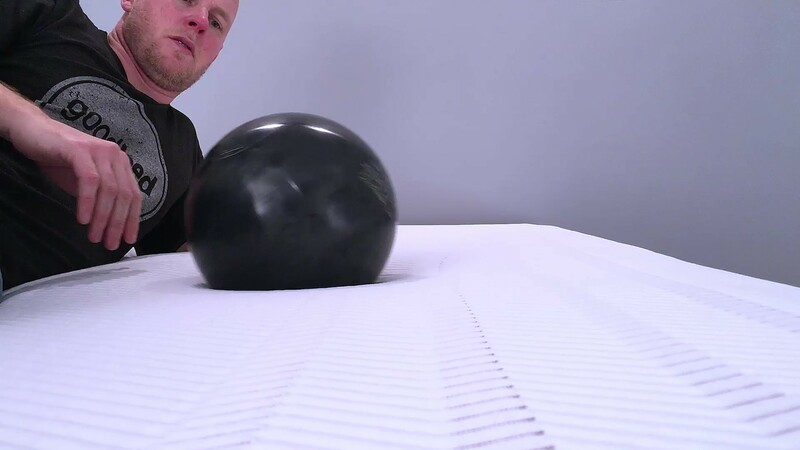 Typically, in our mattress tests, when the pin drops with the bowling ball, it also drops when our tester drops onto the bed. That didn’t happen here. When our tester dropped his weight onto the Purple 4 mattress, the pin barely moved and remained upright. We attribute this to the motion-isolation properties of the pocketed coils in the support layer. In practical terms, we felt that the Purple 4 bed could be a good choice for couples who don’t want to feel their partner getting in and out of bed, but for those whose partners tend to move around a lot, their partners may feel vibrations/sound from the surface layer of the bed. How annoying or disturbing that is will be subjective to each person. But if motion isolation is a priority, an all-foam bed might be a better choice. For most people, we think the Purple 4 mattress will not feel hot. The construction of the honeycomb gel layer allows for good airflow, and we know that gel in general helps channel heat away from the body. Additionally, the pocketed coils of the support layer should allow for excellent air flow. Overall, we felt that the Purple 4 felt like a very “cool” bed. Purple has some information on its features to reduce overheating. Edge support may be important for those who like to sit on the edge of the bed, or tend to sleep along the edge/side. The Purple 4 has some features that are particularly helpful in terms of edge support. Surrounding the coil and honeycomb layers on all sides is a 3” wide column of foam, actually composed of two different foams. The top four inches closely matches the density and compression depth of the honeycomb layers, while the lower level of edge-support foam is firmer, matching the integrity of the pocketed coil layer. The result is very good edge support overall, and a marked improvement over the Original Purple mattress. When our tester sat on the edge of the Purple 4, he felt very stable, and found that he sunk mainly into the top few inches of the edge-support foam. Edge support felt seamless, and he did not notice the point where the honeycomb gel and the edge foam meet. When lying on very edge of the mattress, he felt completely stable, and never felt like he was sliding off the bed. If edge support is a priority (for example, if your kids or dog like to push you over to the side of the bed), we feel the Purple 4 (and most likely the Purple 2 and Purple 3) are worth strong consideration. Another highlight of the Purple 4 mattress, for our tester, was ease of movement, which owing to the high responsiveness and elasticity of the gel layer, was almost effortless. If you tend to change positions a lot, the Purple 4 mattress performed extremely well in our view. In the case of the Purple 4 mattress, the company makes no claims about the use of natural materials, however the small amounts of foam (mainly for edge support) used in the bed are certified to the CertiPUR-US standard, which verifies that a material has low VOC off-gassing as well as a lack of chemicals and other substances regulated by the CPSC. Purple includes more info on these safety certifications. The top hyper-elastic/honeycomb layer is made of food-grade gel, so it’s rated to be as safe as, for example, plastic cutlery or food-storage bags. Lastly the steel coils should not be a concern for off-gassing at all. If you plan to use your mattress atop an adjustable base, the Purple 4 is a very good choice. In fact, the company even sells its own adjustable base (optional) that can be used with all of its mattresses. We tested the Purple 4 bed with a standard adjustable base and found that right away, the mattress conformed nicely. It lifted a bit at the foot of the bed, but in our experience, mattress tend to relax and conform over time. The Purple 4 is a 13-inch mattress with a unique 4-inch hyper-elastic polymer top layer constructed in a honeycomb pattern, which gives the bed unique support and comfort properties. The support layer is comprised of 8” tall pocketed coils. Sheets of foam separate the two layers and line the bottom of the mattress. Surrounding all sides is a 3” wide foam edge support, and the mattress is wrapped in a stretchy, cushioned knit cover. When it comes to estimating the comfort lifespan of a mattress, we tend to use foam density as our best, albeit imperfect, predictor of how long a foam will retain its shape and resiliency. In the case of the Purple mattress, we expect the top gel honeycomb layer to be extremely durable, barely changing at all. As for the coils support layer, steel springs have a long track record for durability. Overall, we don’t see a weak link in terms of construction that would cause us to doubt the resilience and longevity of the Purple 4 mattress. On balance, we feel that Purple 4 mattress is a standout produce for its excellent support for side sleepers in particular. If you prefer sleeping in this position and have had trouble finding a mattress that works for you, we think the Purple 4 could be an answer. On the other hand, it’s just not a screaming value in terms of price, particularly compared to its online peers. The queen size Purple 4 retails for $2,799; that’s $1,800 more than the Original Purple mattress ($999 queen size) with 2” of honeycomb gel, and also more than the Purple 2 ($1,599 queen size) and Purple 3 ($2,199) that include 2” and 3” of the honeycomb gel respectively. However, this may be a case where the benefits are not necessarily linear. We do feel that the Purple 4 is an impressive follow-up that offers benefits and improvements over the Original Purple with corresponding jumps in price. For side sleepers, and those who prioritize edge support, it performed exceptionally well in our evaluation. The free delivery policy includes set up and removal of your old mattress, a service that costs extra with many other brands, adding to value. 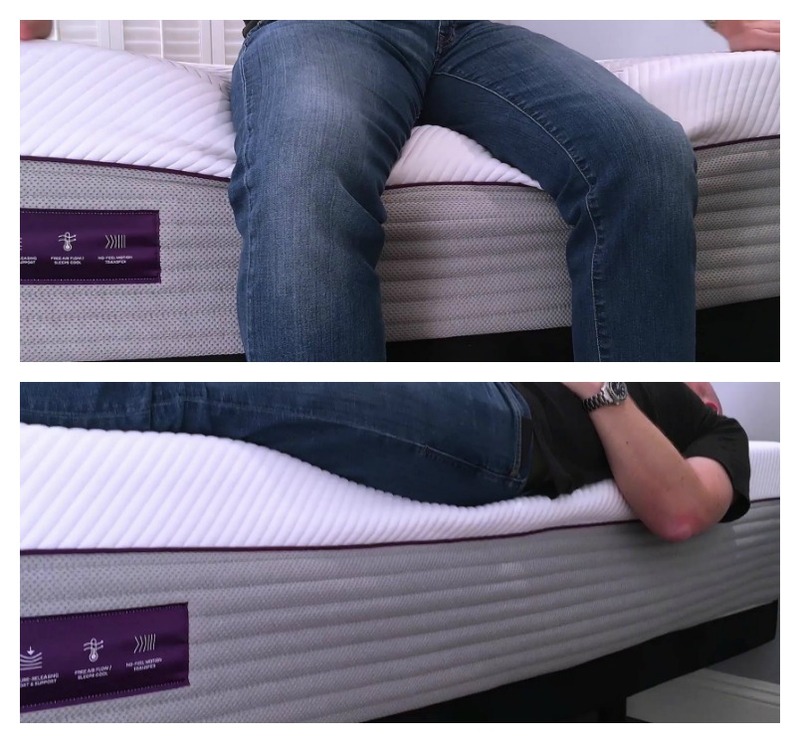 Overall, the Purple 4 does compare well to a luxury innerspring mattress that you might see in a mattress store. Purple includes free delivery, which is not particularly unusual among its competitors. What does stand out is that Purple includes in-home setup and optional removal of your old mattress free of change. This “white glove service” is--more often than not--an added service with other brands, costing upwards of $100 more. One of the biggest, if not THE biggest complaints about any mattress from consumers regards body impressions — the inability of a mattress to spring back, eventually creating a low spot/sinkhole in the mattress. As such, mattress warranties all contain a term defining how big a sag or ‘body impression’ (measured when no one is on the mattress) is considered a defect, and thus covered under the warranty. The industry standard for mattresses is generally between ¾” and 1.5”. Purple has chosen to cover indentations that meet or exceed 1”. Practically speaking, that means any softening or sagging would need to be at least that deep before the warranty would offer you protection. See: Purple Warranty. Summary: Is the Purple 4 Mattress Right for You? The Purple 4 impressed us most for pressure relief and support for side sleeping, as well as exceptional edge support. Based on our findings, here’s who we think is the best and worst match for a Purple mattress. Is the Purple 4 bed right for you? Take our Mattress Match Quiz to find mattresses that fit your needs, based on your preferences and price range. Looking for more on the Purple mattress? Visit Purple.com. Is sticking with innerspring right for you?